Faced with shorter time-to-market schedules, challenging cost constraints, and ever-increasing customer expectations, manufacturers are accelerating their use of mobility applications. They’re also using them to galvanize production, finance and selling strategies into a unified direction so customers’ expectations can better set and exceeded. One manufacturer’s CIO summed it up well when he said they hit an inflexion point when their marketing analytics showed over 60% of dealers were looking up product and pricing data on their smartphones and tablets instead of their laptops, a 4X increase in just five months. Email and calendaring (46%), Instant Messaging (IM) (37%), and office & personal productivity (26%) are the three most popular uses of mobile applications today according to a recent Gartner survey. CRM, at 19%, and ERP, at 17%, have been predicted to grow the fastest of all enterprise applications on the mobile over the next three years. 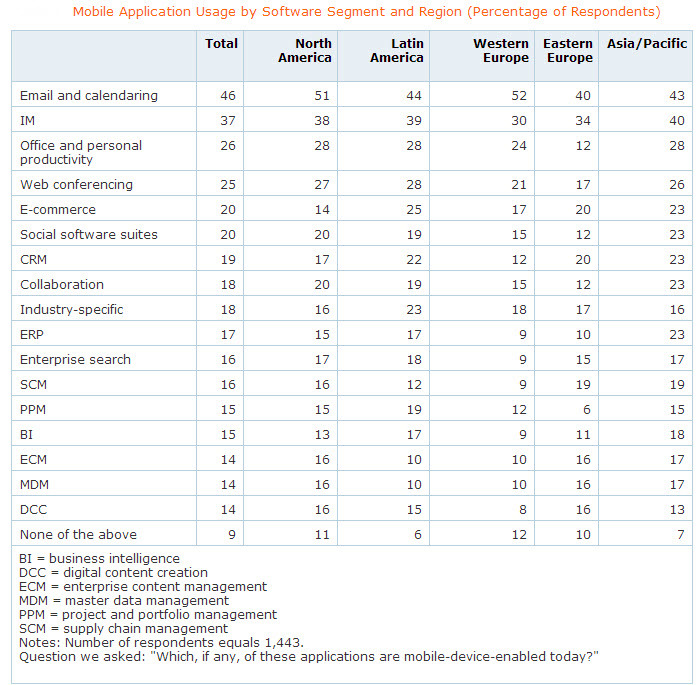 The following is a table showing mobile application usage by software segment. Source: Gartner User Survey Analysis: CRM, Cloud and Mobile Dominate Application Software Spending Trends Published: 6 March 2013. Mobility solutions (SMS, Mobile apps, Mobile Web) are the most used and planned for self-service channel (29.3%) according to a recent Gartner survey. This is followed by Web Chat (25%); Social CRM (25%); Virtual Assistants (23.6%); Collaborative Browsing (21.4%); Video Services and Video Chat (18.6%); Web-Based Self-Service Supported by Knowledge Engine (15.7%); IVR Self-Service (10.7%) and e-mail response management (9.3%). For the fully survey results please see Gartner Market Trends: Customer Management BPO Matures With BPaaS and Multichannel, Analytics, Marketing and Mobility Services Published: 8 April 2013. 84% of smartphone shoppers use their phones while in a physical store and 30% use their smartphones to find information instead of asking store employees. according to a study released this month from Google. The study, How Mobile Is Transforming the Shopping Experience in Stores, can be downloaded here. The study also found that 65% prefer mobile sites and search, and 35% prefer apps, not surprising for a study sponsored by Google. 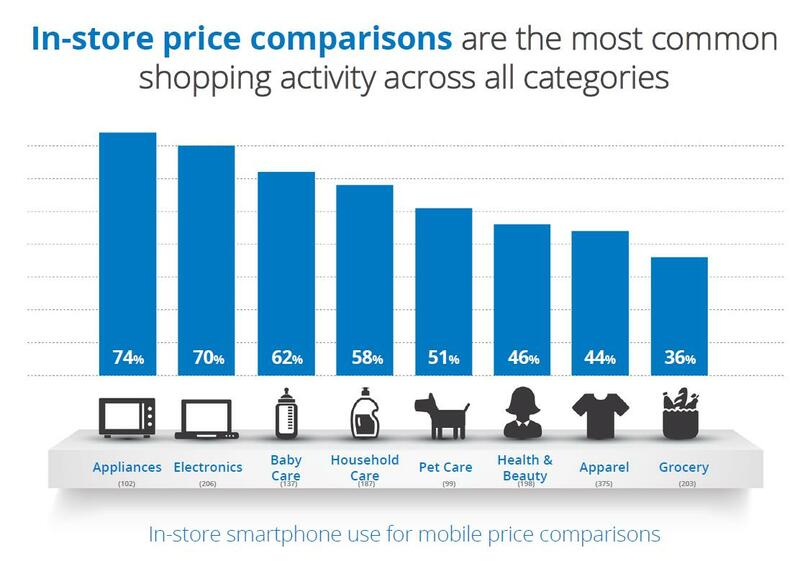 There are several interesting findings in the report, including the finding the in-store price comparisons are the most common mobile activity across the eight categories included in the study. Google’s Android operating system is dominating mobile operating systems shipments according to both Gartner and IDC and will continue to lead the market through 2016. 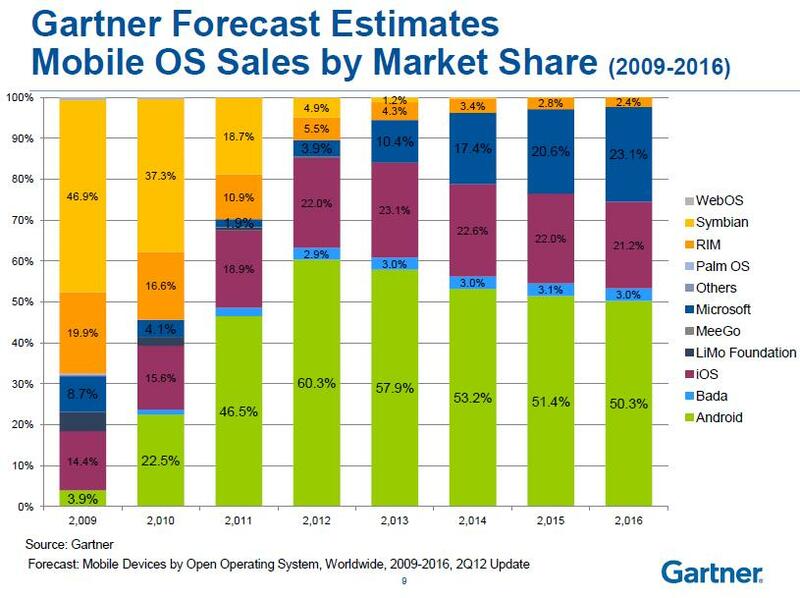 The following graphic shows Gartner’s analysis of 57.9% of all mobile devices globally running the Android operating system in 2012. Source: Gartner: Bring your Own Device (BYOD): Mobility Trends and Securing the Transition. Lawrence Pingree, Research Director. Also see my previous post, 2013 Roundup of Smartphone and Tablet Forecasts & Market Estimates. 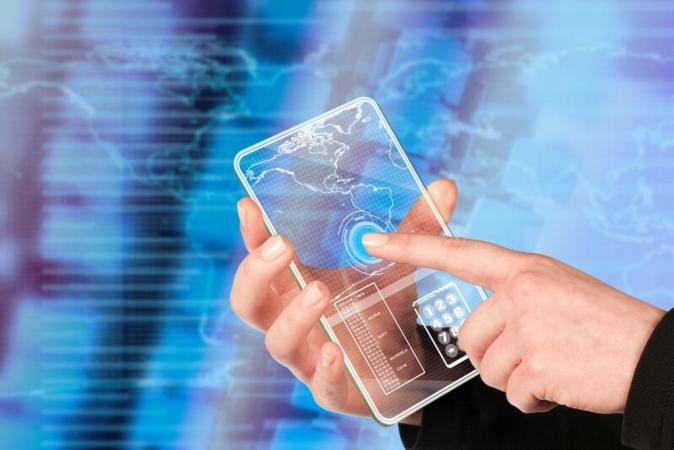 IDC’s prediction of how mobility will drive intelligent systems adoption, in addition to device management research on smartphone and tablet adoption is covered in the presentation, The Mobility Game Changer; Why The Workplace Will Never Be The Same. 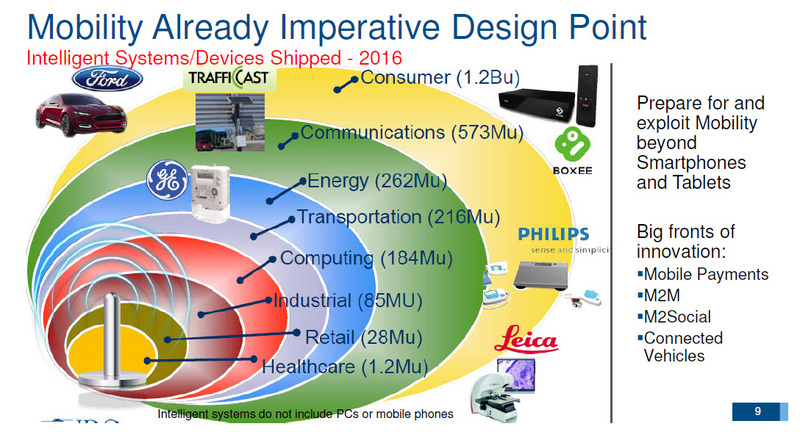 The following graphic shows IDC”s forecast of mobile-based intelligent device shipments by market and industry. The value of mobile payment transactions will reach $721B in 2017, attaining a Compound Annual Growth Rate (CAGR) of 35% for the period 2012 to 2017. The volume of transactions will be $23.2B, attaining a 33% CAGR in the same forecast period. Source: Gartner Forecast: Mobile Payment, Worldwide, 2013 Update Published: 15 May 2013. The value of Mobile Payment Transactions on Mobile Web platforms globally is forecast to increase from $86.1B in 2013 to $320B in 2017 attaining a projected 38.8% CAGR. Source: Gartner Forecast: Mobile Payment, Worldwide, 2013 Update Published: 15 May 2013. Global mobile payment transaction value is projected to grow from $235B in 2013 to $721.3B in 2017, attaining a projected 32.4% CAGR. Source: Gartner Forecast: Mobile Payment, Worldwide, 2013 Update Published: 15 May 2013. The fastest growing types of mobile payment transactions globally as measured by projected CAGR from 2012 to 2017 include ticketing (51%); airtime top-ups (40%); merchandise purchases (38%); bill payments (35%); and money transfers (33%). Source: Gartner Forecast: Mobile Payment, Worldwide, 2013 Update Published: 15 May 2013. Gartner predicts that by 2016, there will be 310B downloads with an estimated value of $74B in revenue from app stores. Gartner has also predicted that by 2017, 25% of all enterprises will have an app store. This includes both new application purchases and recurring revenues form subscription pricing models. Source: Gartner Market Trends: Mobile App Stores, Worldwide, 2012. 90% of global mobile app store downloads in 2013 are forecast to be free, increasing to 93% in 2017. 73.2B free downloads will occur in 2013, increasing to 287.9B by 2017. Paid-for downloads will increase from 8.1B in 2013 to 21.6B in 2017. Source: Gartner Market Trends: Mobile App Stores, Worldwide, 2012. In-app purchase will drive 41% of the store revenue in 2016. While the market is moving toward free and low-priced apps, in-app purchase will increase in both the number of downloads and in the contribution to the store revenue. As a result, we see a shift in user spending from upfront purchases to in-app purchases. Source: Gartner Report Market Trends: Mobile App Stores, Worldwide, 2012. 99% of the paid-for app store downloads cost less than $3 each. Similar to free apps, lower-priced apps will drive the majority of the downloads. We estimate that apps between $0.99 and $2.99 will account for 87.5% of the paid-for downloads in 2012, up from 86.8% in 2011. That percentage will further increase to 96% by 2016. Source: Gartner Report Market Trends: Mobile App Stores, Worldwide, 2012. Global mobile app store revenue is projected to reach $24.5B in 2013, increasing to $74B in 2017. Paid-in downloads (69%); in-app purchase (17.3%) and advertising (13.7%) are the three revenue sources in 2013. In 2017, revenue shifts significantly to paid-for downloads contributing 45.2% of revenue, in-app purchases, 40.9% and advertising, 13.9%. Source: Gartner Report Market Trends: Mobile App Stores, Worldwide, 2012.